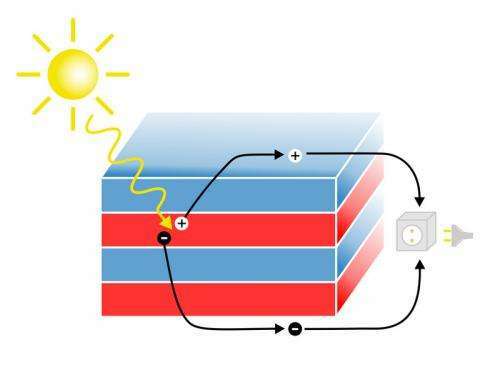 Sunlight is converted into electrical current in a layered structure. Researchers at the Vienna University of Technology show that a recently discovered class of materials can be used to create a new kind of solar cell. Single atomic layers are combined to create novel materials with completely new properties. Layered oxide heterostructures are a new class of materials, which has attracted a great deal of attention among materials scientists in the last few years. A research team at the Vienna University of Technology, together with colleagues from the USA and Germany, has now shown that these heterostructures can be used to create a new kind of extremely efficient ultra-thin solar cells. "Single atomic layers of different oxides are stacked, creating a material with electronic properties which are vastly different from the properties the individual oxides have on their own", says Professor Karsten Held from the Institute for Solid State Physics, Vienna University of Technology. In order to design new materials with exactly the right physical properties, the structures were studied in large-scale computer simulations. As a result of this research, the scientists at TU Vienna discovered that the oxide heterostructures hold great potential for building solar cells. 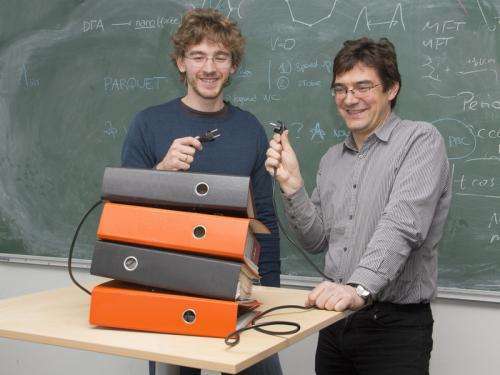 Elias Assmann (left) and Karsten Held (right) demonstrate the idea behind the new solar cell: Light is absorbed by a layered structure, free charge carrieres are produced and electric current starts to flow. The basic idea behind solar cells is the photoelectric effect. Its simplest version was already explained by Albert Einstein in 1905: when a photon is absorbed, it can cause an electron to leave its place and electric current starts to flow. When an electron is removed, a positively charged region stays behind – a so called "hole". Both the negatively charged electrons as well as the holes contribute to the electrical current. "If these electrons and holes in the solar cell recombine instead of being transported away, nothing happens and the energy cannot be used", says Elias Assmann, who carried out a major part of the computer simulations at TU Vienna. "The crucial advantage of the new material is that on a microscopic scale, there is an electric field inside the material, which separates electrons and holes." This increases the efficiency of the solar cell. The oxides used to create the material are actually isolators. However, if two appropriate types of isolators are stacked, an astonishing effect can be observed: the surfaces of the material become metallic and conduct electrical current. "For us, this is very important. This effect allows us to conveniently extract the charge carriers and create an electrical circuit", says Karsten Held. Conventional solar cells made of silicon require metal wires on their surface to collect the charge carriers – but these wires block part of the light from entering the solar cell. Not all photons are converted into electrical current with the same efficiency. For different colors of light, different materials work best. "The oxide heterostructures can be tuned by choosing exactly the right chemical elements", says Professor Blaha (TU Vienna). In the computer simulations, oxides containing Lanthanum and Vanadium were studied, because that way the materials operate especially well with the natural light of the sun. "It is even possible to combine different kinds of materials, so that different colors of light can be absorbed in different layers of the solar cell at maximum efficiency", says Elias Assmann. The team from TU Vienna was assisted by Satoshi Okamoto (Oak Ridge National Laboratory, Tennessee, USA) and Professor Giorgio Sangiovanni, a former employee of TU Vienna, who is now working at Würzburg University, Germany. In Würzburg, the new solar cells will now be build and tested. "The production of these solar cells made of oxide layers is more complicated than making standard silicon solar cells. But wherever extremely high efficiency or minimum thickness is required, the new structures should be able to replace silicon cells", Karsten Held believes. "The oxides used to create the material are actually isolators. However, if two appropriate types of isolators are stacked..."
Perhaps the author meant "insulators"
lol, yeah, insulators no doubt. I'm not holding my breath until they actually manage to fabricate one AND demonstrate that it works. Then there's the added complications of durability and manufacturing. If the material is too prone to defects and such then it may not be useful, for example. There are a TON of ideas like this floating around right now, but none of them seem to be 100% ready for prime time yet. Some of the best work I've seen recently in this field is coming out of MIT. I'd keep my eye on them if you're interested in advanced thin film solar cells. This is getting ridiculous. Almost every day there is an article about some awesome discovery that *should* allow to create better solar cells. Like the child who cries wolf, at some point people won't pay attention anymore. Anyone who posts in clear contravention to forum guidelines deserves no less for his complete regard to netiquette. @DavidW: You're off-topic and you hardly make sense. Who really knows the perfect time? If we discover too fast it appears that extinction is a really possibility, sooner, rather than later. But then if all humans are going to eventually die, then perhaps less suffing now is better? The truth is what tells us that life is important. The truth says to try to do the most good. The real power rests with the truth. This is the power that we people need to remember. The truth tells us? Would that be in English? Mandarin Chinese? In Maths? Did the truth speak to ya about staying out in the sun to long and letting your brain getting short-circuited? I think that is about as close to the truth and this topic ya're going to get. DavidW, did the truth say to ya anything about the subject of this article? Maybe the truth told ya to not bother reading the article and just jump on in with the "truth's" whisperings in your ears. They have medication for those type of truths. Come dude. you think you have a point? huh? I'll be more than happy to debate you in front of everyone you know witnessing the truthful facts, crying and shaking in disbelief... as you try to find excuses for your bad behaviour. Any day, bring it on. Until then, sit down and shut up. Is that a general Dude? Or a specific Dude? If it's a general generic dude, I'm game. But I've got to head home for now,,,,, tomorrow maybe? Spend the night productively, I'll spend mine sleeping. Toot-A-Loo. Mmmmm ... more layers? Although each layer/interface is but one more barrier for power flow to jump. ... Perhaps the author meant "insulators"
Isolators v. insulators, a semantic / language difference, most likely. The Viennese think different? Not! David, our purpose it to create super advanced technologies and then combine them with advanced technologies developed by life in other galaxies......to create a hyper technology that becomes one with the universe (merges with the fabric of the universe). Thats the best i can think of. So exactly why are you wasting your life playing "fairy in the sky" again? "This is getting ridiculous. Almost every day there is an article about some awesome discovery that *should* allow to create better solar cells. Like the child who cries wolf, at some point people won't pay attention anymore."